Hi folks,my name is Lance Dunham and I was born in 1954 here in Bradford County. I grew up fishing the local waters in Bradford County beginning from an early age of 5 and still live here in New Albany, close to the river. I've fished the North Branch of the Susquehanna for 15 years hard before I started to guide in 1980 and have been going strong ever since. My Pa Guide permit is #102 and I am insured and certified in first aid and CPR as specified by the Pa Fish and Boat commission . As of 2019,I have 54 years of river fishing experience, 39 as a guide. NO OTHER GUIDE CAN MAKE THAT CLAIM ! I hit the gym at least once a week with a trainer and twice a week work out at home so I can physicly handle any situation to help my clients. I use a custom made 21ft SeaArk Bay jet boat with a 8ft beam and a 250hp Merc OptiMax Pro XS motor that can get us to the waters not used every day. I'm fortunate to have a 80% client repeat bookings. I view each day as an exciting experience to fish with my repeat client/friends or new clients/soon to be friends. My clients can tell you that I never get bored or burnt out, there are just too many good fish to be found everyday and you just never know when that fish of a lifetime might strike! I don't take time off to do fishing tournaments, never cared for the crowds, or to fish other waters in PA,(I will do a TV show or video on the river now and then). I am very happy to fish just with you somewhere on the 60 miles of my home waters here on the North Branch of the Susquehanna River. This ensures that you have a guide who knows every rock in his area, where the fish hide every day and at any time of the year. I take a group of people to North Maine each year to Wilderness Escape Lodge for some great fishing in the summer. I pro-staff for several companies and write monthly fishing columns for the "Sullivan Review" newspaper and "Susquehanna Fishing" magazine. 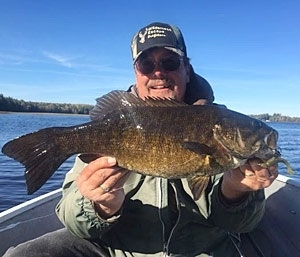 I do several TV shows a year with Alan Probst of the "Wild Pennsylvania with Alan Probst" show and I do the occasional video with "Delaware Valley Outdoors" and have been featured on "Pennsylvania Outdoors" I also make my own DVD's on fishing for sale on my website. I believe that being a fishing guide is the best profession in the world, when Mother Nature lets you work and when she doesn't I'm happy , shooting , making fishing lures, doing outdoor photography, videos and writing. In the off season I hunt as much as I can. Come fish with me, you won't be sorry. Lance's favorite soft plastics, colors and sizes. Lance's other STC lures he uses. All STC's lures are Guide tested for all ranges of angler's skill.